Every tourist drives to Lahaina several times per week. It is the center of shopping, activities, charter boats, entertainment and restaurants. Most tourist will spend 15 to 45 minutes driving there. You can walk! (about 20 minutes) or you can drive in less than 5 minutes. Below is a Lahaina panorama: "Cheese Burger in Paradise" on left over to a cruise ship outside harbor on right. Lahaina even has a Hard Rock Cafe. 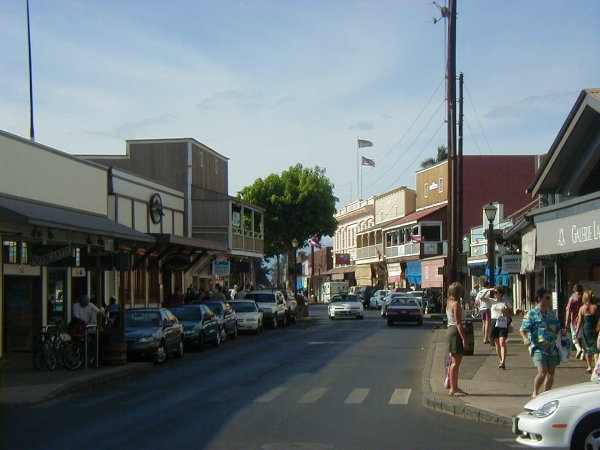 Lahaina is historic! It was the first capitol or Maui, then a whaling village, then a port for US Navy. Many of the old buildings remain on front street. The charter boats at the harbor. Panorama of Lahaina and Puamana (far right) from a Blue Hawaii Helicopter.